Wow, so far I am loving this new podcast. Obviously, civil war history is incredibly timely at the moment, but even if we weren't having assholes praising Robert E. Lee at the moment, this whole series seems structured to help explain where we are now in the US politically, culturally, economically, etc. This show is context for life now, and entertaining, well written, well produced, etc. This episode in particular is really just a super exciting story - makes you wonder (again, if you were already wondering) why there aren't a ton of Hollywood movies about the daring of Harriet Tubman and her peers (although she's mostly peerless - this episode shows there were other, lesser known heroes of that time and place). I definitly cried when Chenjerai Kumanyika describes his movie version of these events, and then they pull back narratively to let Fallon Greene close out the story. Two episodes into this podcat, and I'm loving it. Not much to say other than wow. I hadn’t heard of this but am looking forward to checking it out. 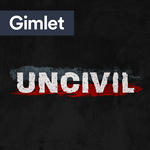 I found this through the wonderful podcast The Nod-check it out if you haven’t already-and have been telling everyone I can about this episode gripping and powerful-and such an illustration about how everything I was taught about about the Civil War is white washed.